Customer and friend Matt Reppert did it again in 2016, picking up his third S.C.C.A. Improved Touring S (ITS) A.R.R.C. title in his E30 BMW. The five time Atlanta Region Pro ITS champ returned to Road Atlanta this year with a fresh M20 powerplant and a host of chassis tweaks to make a charge against the fast Honda’s that have been dominating the class lately. It was Reppert’s strongest A.R.R.C. performance yet in a very competitive S.C.C.A. ITS field that included Bowie Gray in Chuck Baader’s well prepared RX-7, Willie Phee’s Acura TSX and Trevor Degioanni, fresh from setting a new Virginia International Raceway ITS track record in Zsolt Ferency’s ’98 Integra GSR. Qualifying was tight and the race promised to be a barn burner. After several lead changes in the early laps Matt legged out a slight lead, then caught a break in lapped traffic to put some distance between him and the rest of the pack. Matt was followed to the checker by Trevor and Willie, both of whom were using Blake Meredith powerplants with HAM heads, giving HAM a clean sweep of the podium. Way to go guys! And congrats to Drivers Trevor Degioannni and Zsolt Ferenczy, and engine builder Blake Meredith on taking first in class in the 13 Hour Enduro at V.I.R. 10/16/2016 and setting a new ITS track record along the way. During one of his stints Trevor put down a blistering lap of 02:13.023 during the 13 hour grind. We’re very proud to supply heads to this team, and congratulate them on a job well done. A lap record in an enduro on a lightening fast track like V.I.R. is quite impressive. Congratulations to Matt Reppert for claiming the S.C.C.A. ITS National Championship during the 2011 American Road Race of Champions at Road Atlanta in his BMW E30 325I. Matt and his crew did a fantastic job preparing his car and Matt drove a great race. Matt relies on Hoffman Automotive Machine Inc. for his cylinder head machine work because he knows we’ll deliver a fast, reliable head that will pass post race inspection. 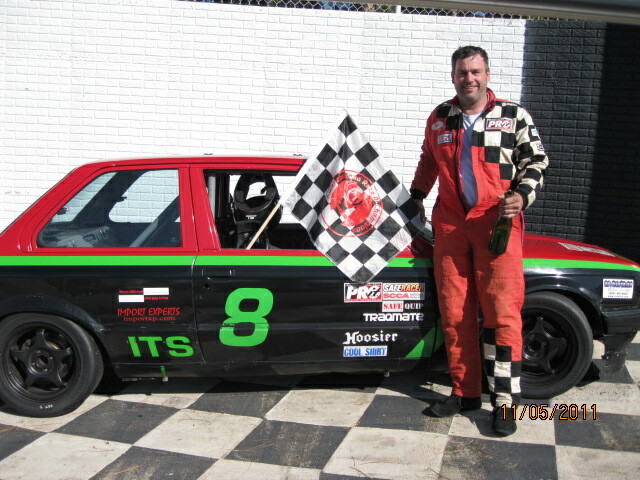 Matt Reppert in Road Atlanta’s victory circle after claiming the 2011 ITS A.R.R.C. title.